I want to start this post by saying that I am so so sorry that I have been absent all this time! Dan & I moved into our own house on February 1st & we haven't had internet installed until now! But, anyway, I am very excited to be back & am so proud to say that my little blog has been nominated for a Liebster award by the lovely Yana and Nailcentric! The Liebster award is a scheme where smaller blogs- with less than 200 Bloglovin' followers - are given an award by other blogs who love them! This helps promote new readers, new friendships and new opportunities! I am so surprised and touched that I have been nominated, even though I only started this blog as a hobby it is something I have come to be very passionate about and work very hard on, so it makes me so proud that someone out there feels it is worth recognition! 1. You must link back to the person who nominated you and answer the 11 questions they asked you. My answers to Yana's questions! Blogging was a hobby for me to start with, I liked having a place to write down and share my thoughts on things in my life, but it has grown to be a passion, it has helped me meet new friends, work with some wonderful brands & discover new products! 2. What is your inspiration source? I get my inspiration from a lot of different things - Life mostly! I Try to get inspired by things I love or that make me happy - not whats popular at that time. It makes me feel creative when the sun is shining and I can spend time outside! 3. If you had to change your blog name, how would you call it? 4. Which is your favorite spring 2014 fashion trend? Its a cliche but I'm in love with pastels - they're soft, girly and great to accessorize! 5. What is your favorite beauty look? This is so hard as make up and beauty are a large part of my life but I think I prefer Understated Beauty - simple & clean, but beautiful! Definitely Beauty for me! In the same way that some people express themselves through what they wear I do through beauty - it makes me feel creative and allows me to discover myself and my style! I love how a beauty regimen can completely change your mood! 7. What do you spend most money on? Ohh that's interesting! I guess it changes all the time! Sometimes I'm like 'Nail polish haul!' or 'Eyeshadow splurge' but right now I think its make up brushes - I'm trying to find one that's amazing but fair on the pocket! 8.What is the beauty product you cannot live without? 9. What is in your handbag right now? 10. Do you have a hobby other than blogging? I love to Horse Ride, I've only done it a few times but its something I'd love to spend a lot more time on! 11. Do you have a pick-me-up positive thought or quote? So, Now its time for my nominations! 10. Which is your go-to Make Up Brand? I want to say another big THANKYOU to Yana for nominating my Blog & I hope My Nominees will enjoy writing their Liebster Posts! Just like me, I'm sure a lot of you were spoilt rotten at Christmas, with new makeups and bath & body treats coming outta your ears! 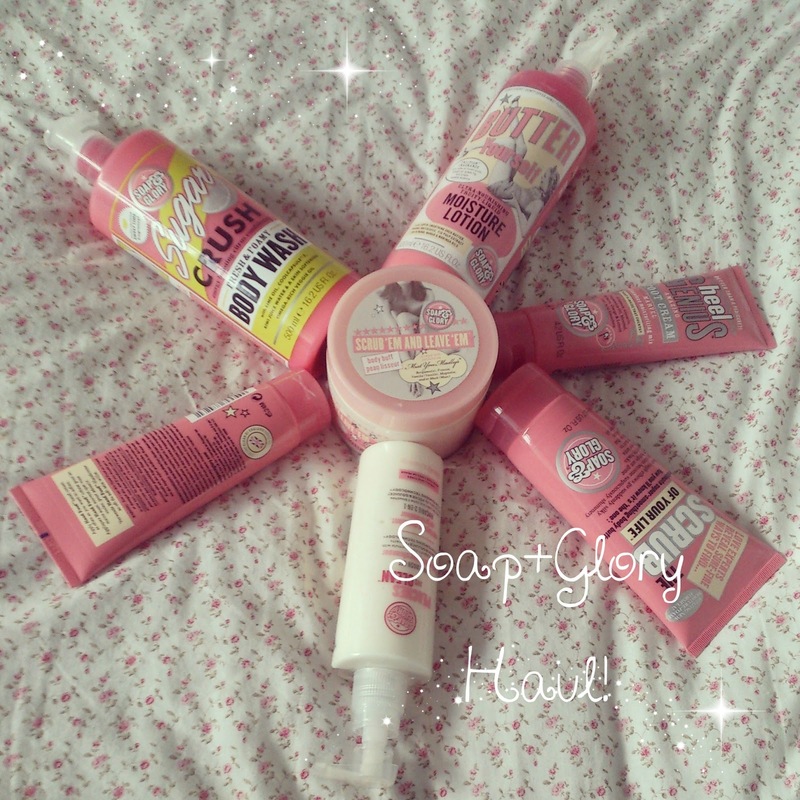 Dan was so sweet and bought me a massive set of Soap&Glory Products! I had never tried them before but I heard many a good thing on Various blogs & my Twitter feed, also, Dan said how much he liked the men's Soap&Glory Range, so I was really excited to try mine out! I wanted to give these products a thorough try before I reviewed them, so here is a post on my thoughts! I'm gonna start with my favourite (I say that now, but I'm sure as the post goes on ill be saying everything is my new favourite haha!). This is 'Sugar Crush', its a fresh, zingy and amazing body wash! The formula is creamy and so soft & it smells incredible, its a fruity and citrus-y and almost fizzy scented! I have used this as good as every single day since Christmas and you wouldn't even know I've picked it up - it lasts ages and the bottle is huuuge! 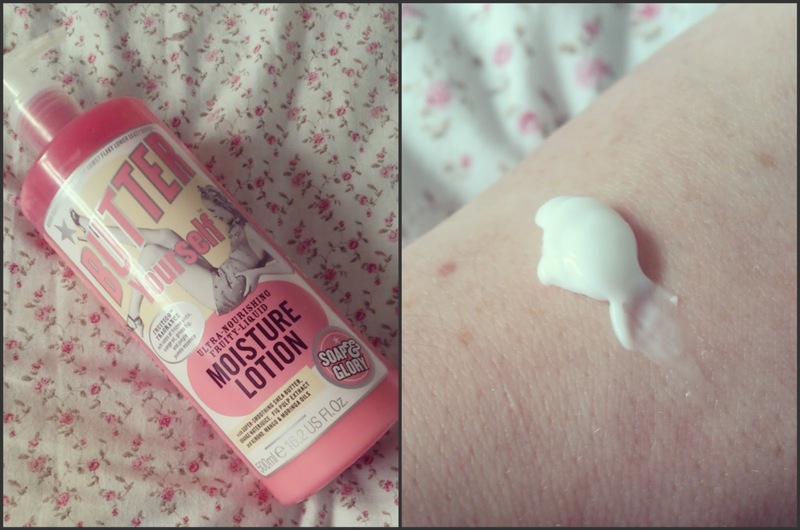 This is 'Butter Yourself' a soap & Glory moisturiser. When Used after the sugar crush body wash it makes my skin super smooth for ages! It smells very sweet, girly and fruity - its made with orange water & fig (plus loads of other ingredients), so its really fresh and you feel so clean and nice after using it! I really like that this is a pump dispensed moisturiser as it means you don't have to dip your fingers into a tub and wont risk spreading bacteria! Say hello, to Peaches&Clean, the 3-in-1 moisturiser which smells as sweet as its name! Hand Food is the perfect hand cream! I love keeping this with me in my handbag as the cold winter air can really make your hands suffer, but this restores them right away! It smells very sweet and is so thick and luxurious - plus its made with marshmallow!! Heel Genius is just great! I like to apply this and then put on some cute socks and leave it to absorb overnight, my feet feel so soft and refreshed after! This is great to use when you've had a long day on your feet and they need a bit of care - it smells all fresh and minty and your feet will thankyou after! I also plan on using this right as summer hits, it will make my feet all clean and lovely for sandal season! Scrub 'em & Leave 'em is the best scrub I have used - it is so coarse - not enough that it'll scratch your skin but effective enough to leave you smooth from head to toe! This is made with jojoba oils and it is even scented with S&G 'Mist you Madly' Scent - so you get a double S&G hit in one! 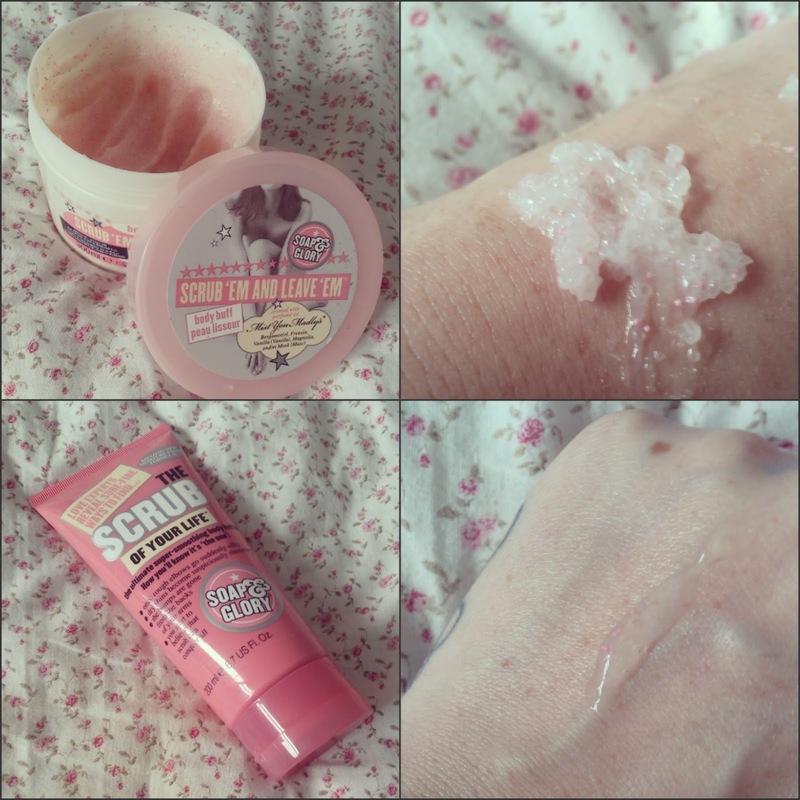 Scrub of your life is another fantastic body scrub, however this one is more gentle and suitable for everyday use. It smells all girly and it foams up when used! This is much more liquidy than 'Scrub 'em & Leave 'em' as it is a shower gel with scrub beads rather than just a body scrub! After all that scrubbing, its important to restore some moisture to the skin & when I'm looking for a richer moisturiser than 'Butter yourself' this is what I go to! 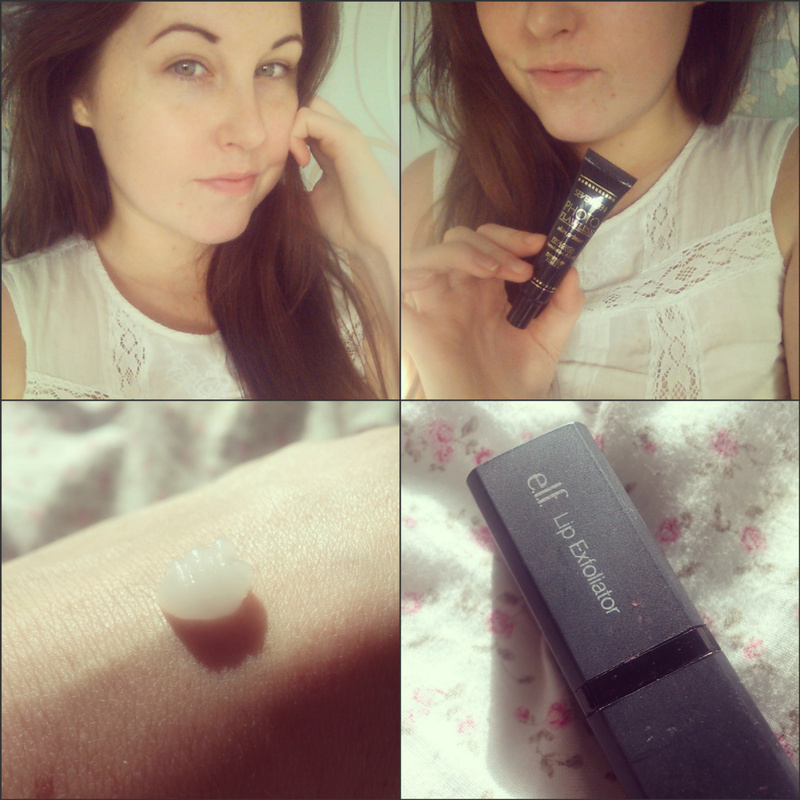 It looks as though I've hardly used any but that's because a little goes a long, long way! It smells fresh and has even won an award, and the thing I like most about this product is that even though it is so thick, it is not oily and doesn't leave you feeling all greasy & slippery! XL Extreme Plump is a lipgloss which makes your lips appear fuller and larger! When you apply it your lips feel all tingly (not painful in any way!) and it starts to work its magic, my lips didn't change drastically but I did notice they were a little plumper than before. This gloss comes in a variety of shades so every girl can give it a try. 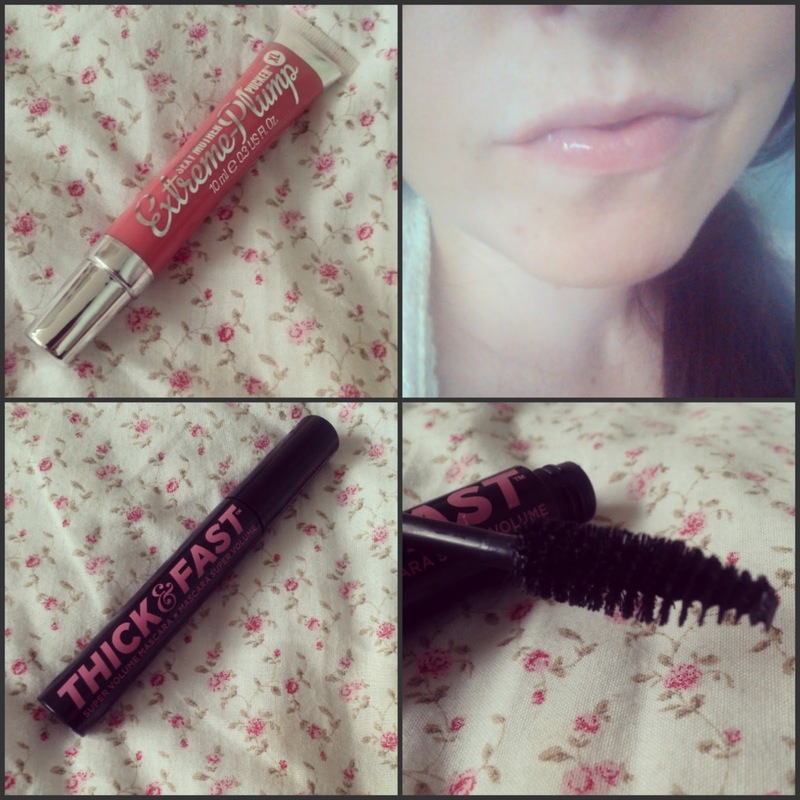 Thick & Fast is an amazing mascara! 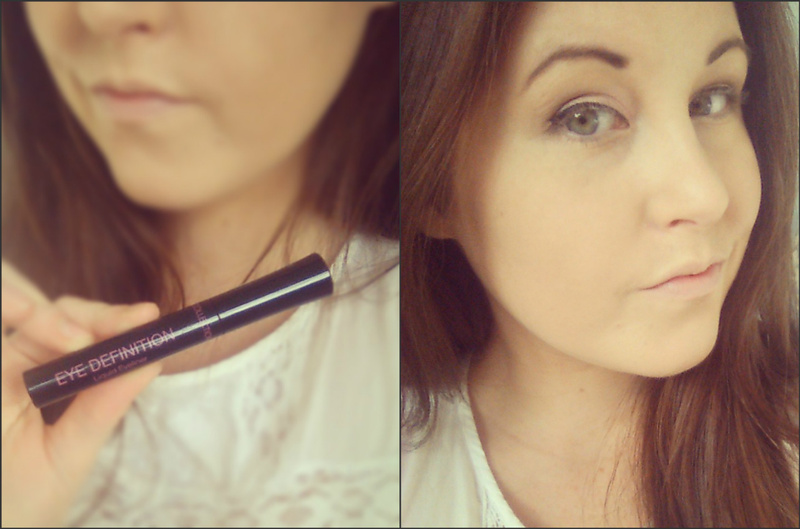 It really does what it says; lashes look voluminous, dark and long in just a coat - I didn't want to apply more than 1 coat as my lashes already looked just how I wanted! This costs £10.00 which is a little more than I'd usually spend on mascara, but for the results I would be happy to buy it again! 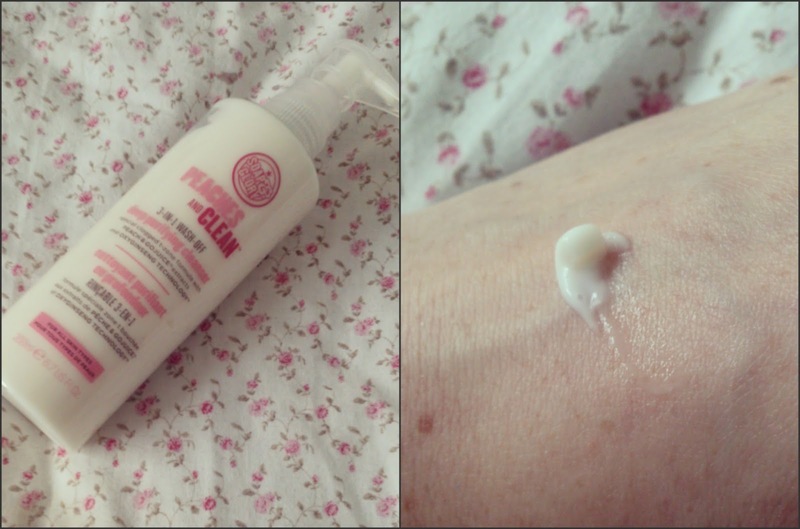 Overall, I was so happy with the results from my new Soap & Glory products, I cant wait to try out some more of their range - I've especially got my eye one the New 'Daily Youth Face wash' and the 'Righteous Butter Body Shimmer' - it looks so Pretty! 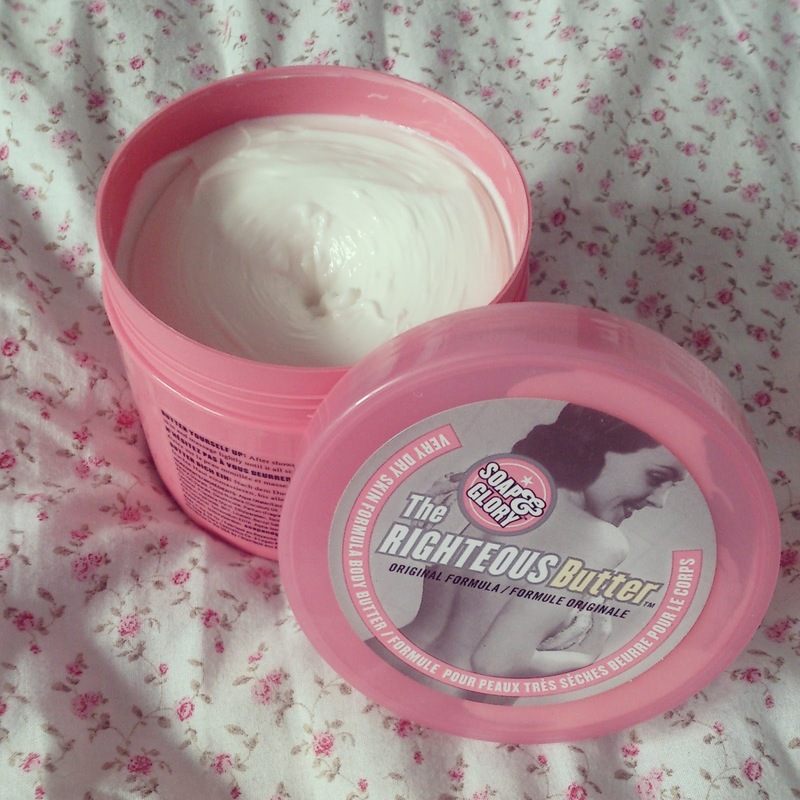 Have you Tried anything by Soap & Glory Before - What would you Recommend I try next? I hope you are all looking forward to Valentines day - even if you don't have a date planned its a great day to spend some time with your friends and family and show them how much you love them - and its a chance to get dressed up! This look is fresh, cute and girly! Perfect for those who like to keep it simple and also for you younger girls who want to wear a little make up on valentines day! As always you should start by making sure your skin is completely clean and moisturised - this will make your makeup look even and flawless! 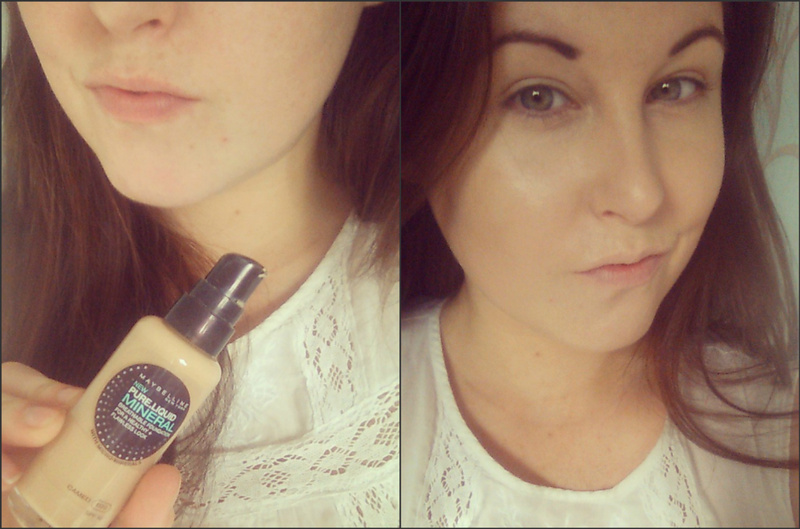 Lets apply a primer to even out the skin tone and stop the foundation from sliding and oxidising! I am using this one by Seventeen - its suuuper soft and smooth. Lets also exfoliate those lips for a perfect pout - it'll make your lips soft and help stimulate blood flow to make them more voluptuous! I am using this lip exfoliator from ELF cosmetics but if you don't have one you can easily make one at home using brown sugar, honey and a splash of olive oil. Now lets do some light contouring for a cute face structure! I am using this contour powder by BH Cosmetics to contour my cheek bones, around my hair line and from just under the inner corner of my eyebrow right down the sides of my nose and on the tip of my nose to make it looks smaller and more feminine! I also contoured just under the middle of my bottom lip for a beautiful shaped lip! 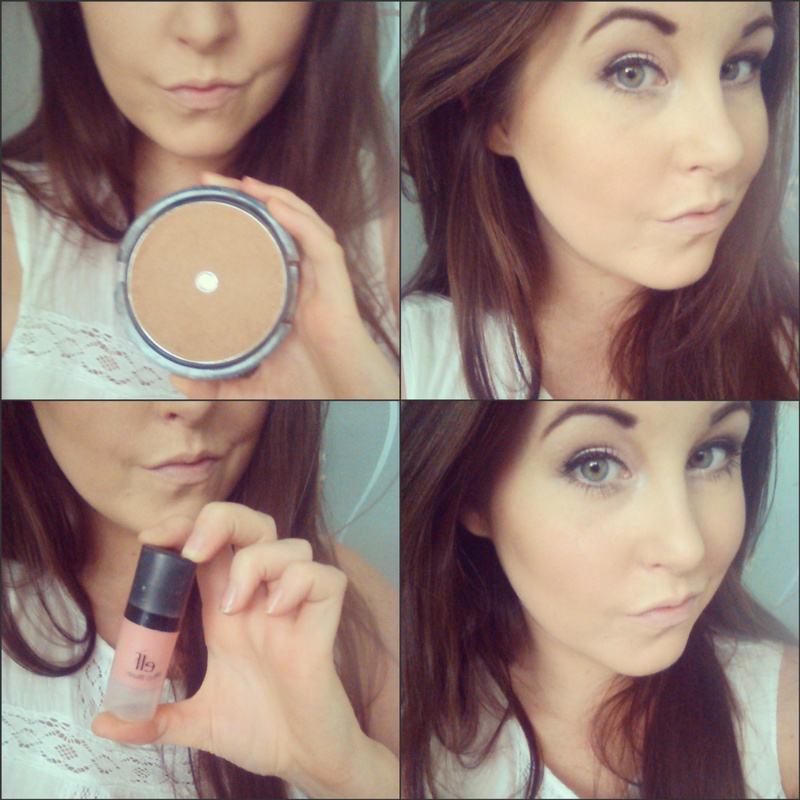 Its time to apply some foundation - you can use whichever one is your favourite! I am using this pure liquid mineral foundation by Maybelline and applying it with a make up wedge all over my face and blending it into my neck so I don't have a 'tide line'! Now lets use some concealer to highlight our faces! Apply some underneath your eyes, down the centre of your nose and on your cupids bow and gently blend it in with your finger or the other side of your make up wedge! This will cover any blemishes and make you look radiant! 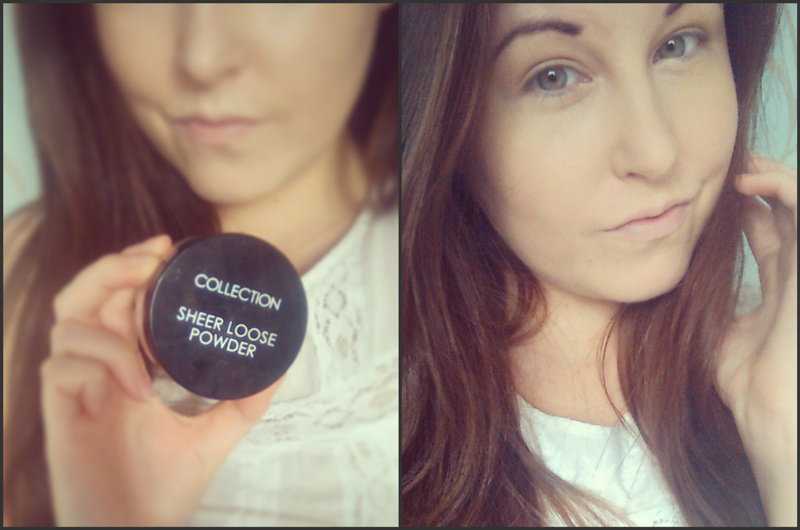 We can use some powder to set our makeup in place and really keep it looking flawless for hours! I am using this sheer translucent powder by collection and buffing it all over my face with my kabuki brush! This powder is lightweight and doesnt make you look cakey - plus it is translucent so it wont leave you with an orangey flush! Its time to decorate your peepers! Let's start by priming the lids, to help your eyeshadow stay in place and help it to apply evenly. 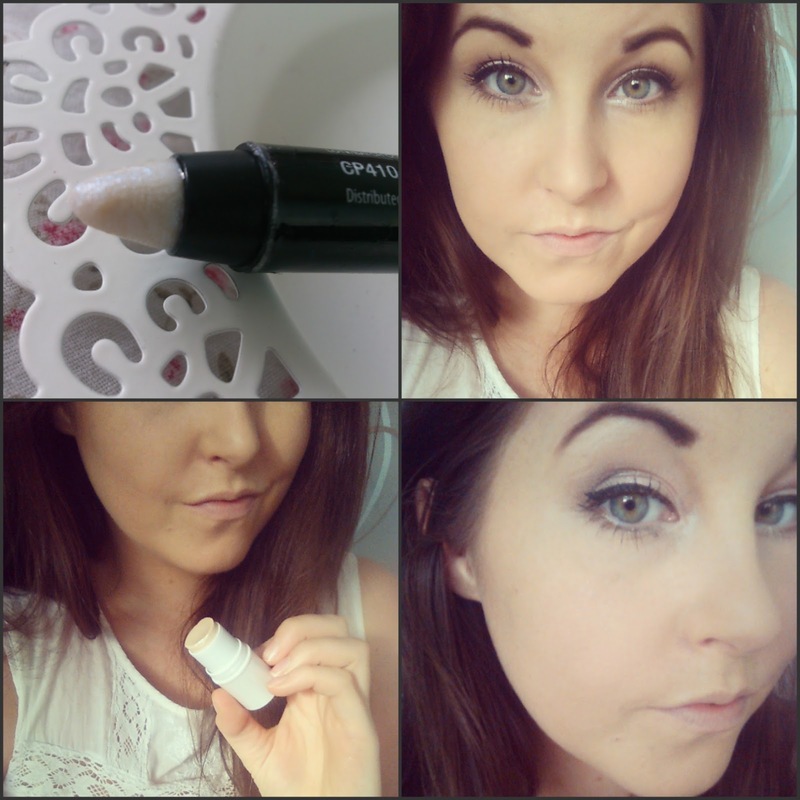 I applied this ELF eyelid primer on my eyelid and dabbed it in with my fingers gently! 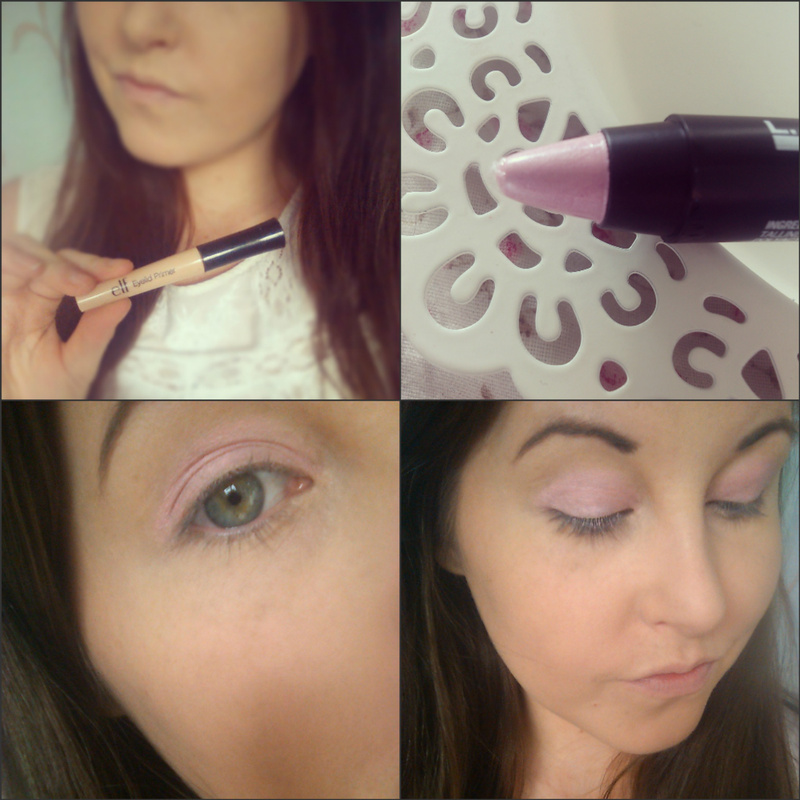 Then as a base shadow I am taking this Jumbo eye liner pencil by L.A colors in shade 'pretty in pink' and smudging it alllll over the eyelid and just above the crease, you can blend this in with a brush a little if you like! The next step for the eyes is to draw the colour out a little - pink can be hard to wear on some skin tones but if we apply a shimmery champagne shade over the top of it, it will be more wearable and balanced, but still girly and pretty! I am using this shade 'bootycall' from the Urban decay Naked 2 palette and my fluffy brush to blend it in with the pink shade we applied earlier! Now lets add a little depth back into the eyes .. wearing such light shadows can make the eyes look flushed out but if we add in some natural tones it will re-balance the eyes and bring them to life! 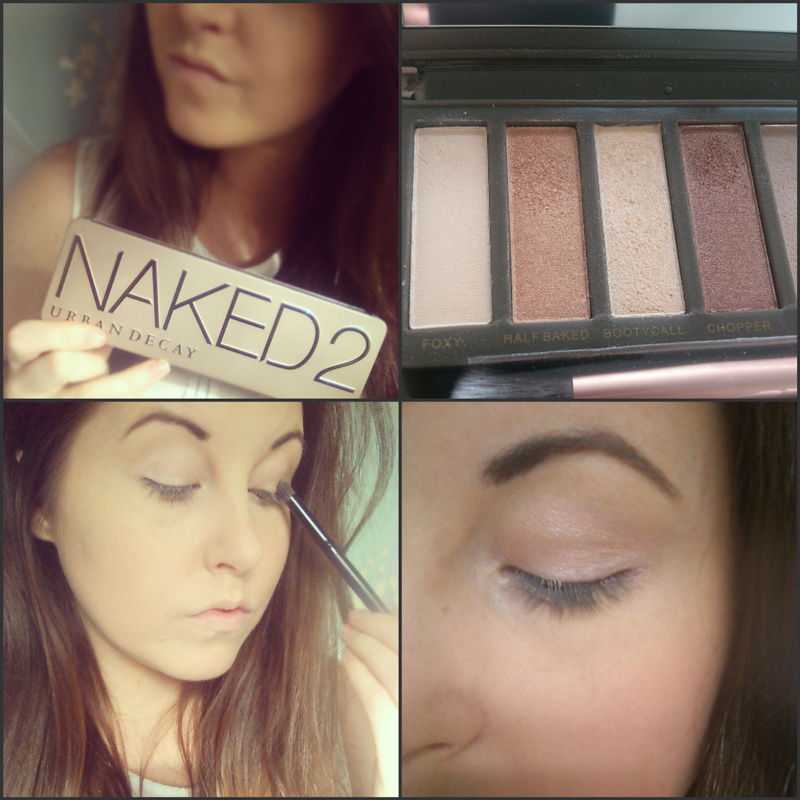 Take a very light matte brown ... like this one called 'Tease', also from the UrbanDecay Naked 2 palette and apply it just on the outer two thirds of the crease of your lid! Next, we can create some flirtation with a little eyeliner ;) This will open the eye and give it beautiful shape! I am using this black liquid liner by Collection to create a delicate feline flick - but you could use whichever eyeliner you are most comfortable with! 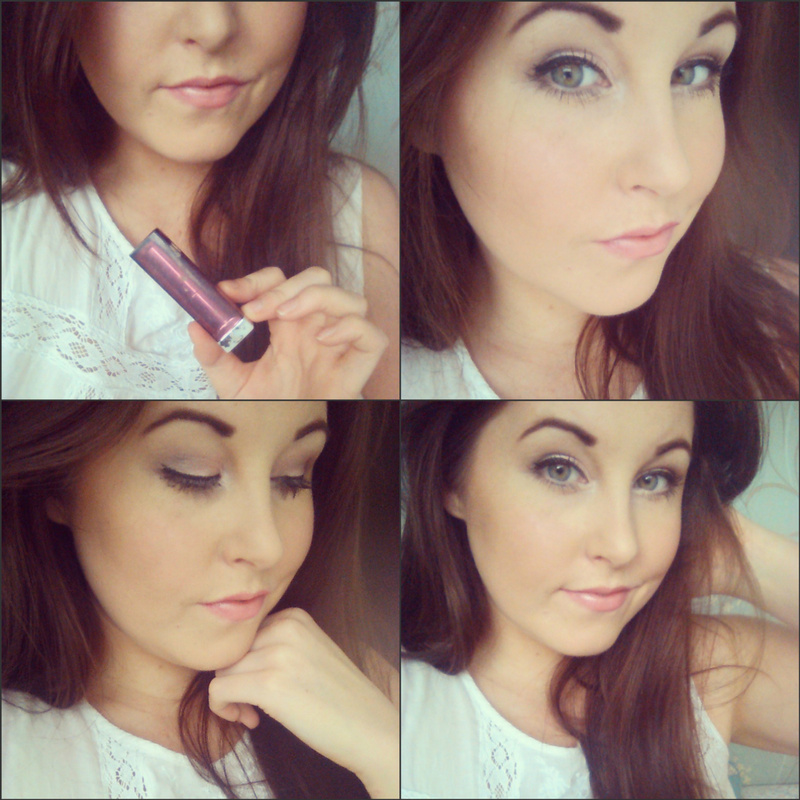 If you are not sure on how to apply your liner, you can check out my guide just here! You can easily make your eyes more open and defined with a swipe of your favourite mascara - I am using this Victoria's secret epic lash mascara as it separates my lashes and makes them long and dark! I applied this to my top and bottom lashes. You could even add one some false lashes for extra girlyness, but as I am keeping this a simple and casual look, I have decided to leave them out! Now lets really make those eyes shimmer and shine! I'm taking this Jumbo eye pencil by L.A colors in shade 'iridescent light' and applying it just on the inner corner of my eye and on the inner third of my lower lash line - this will make the eyes appear open and so bright! 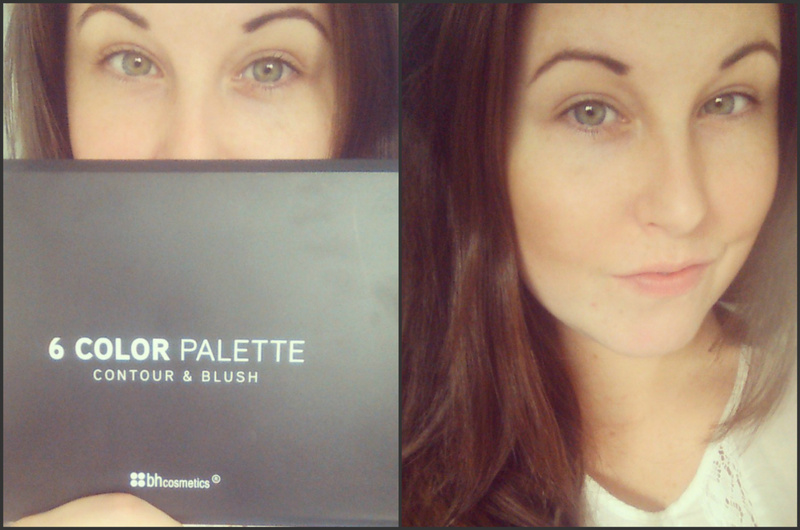 Lets also highlight those brows for maximum eye appeal <3 You can use any highlighter you like best and gently sweep it just along the brow bone and blend in to make the area appear larger and more structured - I am using this all over colour stick by ELF in shade 'spotlight' - I love this as it is not too harsh, it is perfectly subtle! Lets follow this by giving a little exrta structure to the face - I am going to apply a delicate sweep of blusher just along my cheek bone - we have already contoured here so you really don't need much, just enough to give nice definition! Then add a little colour to those cheeks! As the eyes are so shimmery I am going to use a matte blush so that the whole face is not overloaded. I am using a pea sized amount of this ELF HD blush in shade 'Headliner' and dabbing it just onto the apples of my cheeks for a cute pink cheek! Now we can complete the look with some pout action! I know some of you don't like to wear bold lipsticks so I have shown a possible alternative below because this look is very versatile and will work with whatever you are comfortable with! The first option is this hot pink lip - to achieve this I used the MUA Luxe Lip Velvet in shade 'funk' - these are great as they dry matte and do not budge for hours! Or, you could try a lighter pink lip - this is very cute and girly - and not too bold if you are having a daytime date/hangout! I think I like this one best! 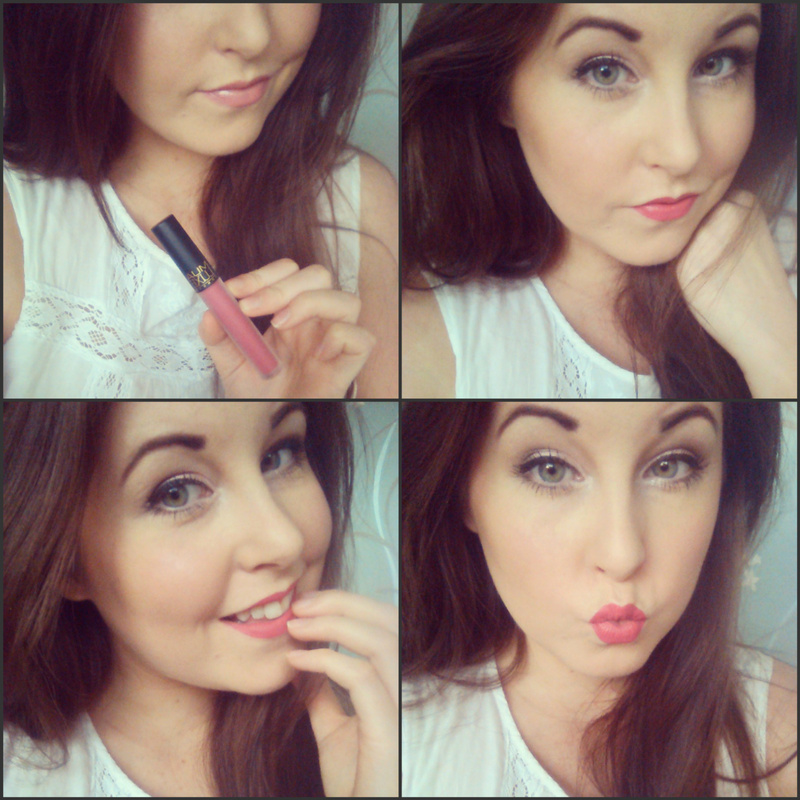 To get this lip I used the Maybelline color sensation lipstick in shade 'pink pearl' and just applied one swipe! Ohhh! and don't forget to spritz with your favourite scent before you go! I am also using some of this cute glitter puff I got from the body shop! 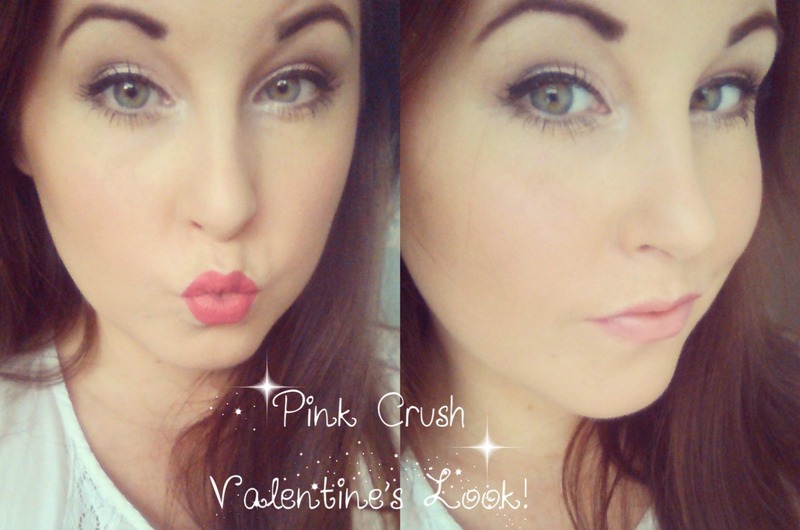 Which has been your favourite of all my Valentine's Looks? I also wanted to take this chance to tell you about a very special blog post I am planning and want you to be involved with! I will be writing a post named 'my perfect imperfections' where I will be celebrating our imperfections and appreciating how they make us unique, individual, beautiful and most important - they make us who we are! So, I want you all to tell me about your perfect imperfections and be featured in the post - everyone who sends me a comment will be featured as I want us all to feel special! You can send me an image or just a comment, but don't be shy - join in!